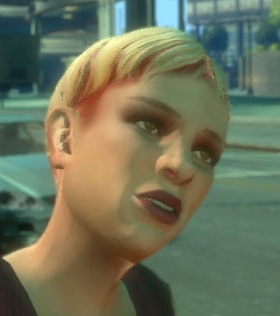 Sara is a random character in Grand Theft Auto IV. She is a woman who seems very concerned about her appearance and the decline of her good looks. She also claims to be a part of the "fashion world" in Liberty City. When Niko Bellic first meets her in Suffolk, she asks him for a ride home. She lives in Varsity Heights, because she claims Middle Park East and Suffolk are too "vanilla". She also mentions that she spends $1000 a month on vibrators, because her ex-husband is impotent. Upon arrival, she introduces him to her ex-husband, telling him that she has been sleeping with Niko and that he's "hung like a rhino". The ex-husband then becomes enraged and starts to attack Niko, at which point the player can beat up the husband or run away. Niko bumps into her again later, for the last time, at Pier 45, and she asks him to go collect a package from a Perseus store and bring it to her photoshoot. By the time Niko asks the Perseus store clerk for the package, he tells him that Niko needs to pay $500 for it, because he said "that is the way things work there". The player can either pay up, or kill the clerk along with the guard (triggering a 2-star wanted level), then pick it up. Whether bought or stolen, deliver the package to her, and Sara will reward you $1000 for the favor.